The second edition of this popular industrial guide contains descriptions of more than 1100 currently available water-soluble resins, supplied by 47 manufacturers or distributors of these products. Both natural and synthetic resins are described, including cellulose ethers; collagens, gelatins; natural gums; and synthetic resins, their dispersions, emulsions, and solutions. Only the most recent information has been included. 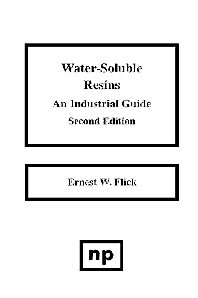 Engineers, scientists, and formulators who need to incorporate water-soluble resins in their products.